Shake things up a little bit during this training camp that incorporates highly functional movements performed on a natural training ground. Join your hosts in Spain and develop a much higher variation in range of movement. Stimulate your muscles with bodyweight and conditioning exercises, boxing, parkour, yoga and mobility work, and apply muscle release techniques. Keep things fun and take advantage of a location in sunny Spain and break up a monotonous movement lifestyle. During this training, you will stay either in a shared or a private room at a comfortable country house. The country houses are located at the foot of the natural park and cliffs of La Breña, just a short walk from the magnificent beach of Zahora and its characteristic Trafalgar Lighthouse. Each house contains five rooms, including two bedrooms, a combination of living room and dining room, a kitchen with American-style breakfast bar, a bathroom, and a terrace. They houses are already equipped with kitchen utensils, sheets, towels, a real wood burning fire, television, and a nearby parking lot. Within the backyard gardens, there is also a communal barbecue, in case you get the urge to do a little grilling on your off day. All guests have free access to the swimming pool and Jacuzzi area at the hotel, which is situated just down the road from the houses. Most of the participants choose to stay in the houses as they are the usual pre-training meeting point and meal setting of choice. However, if you prefer a little more privacy, a hotel room accommodation is also available. In both the houses and the hotel rooms there are options for a large double bed or separate single beds. A Wi-Fi connection is available at both the houses and hotel area. However, it is recommended that you limit your time in front of a laptop or device as much as possible during your stay. Some people make the same commute to work everyday, sit hunched over their computers for eight hours, and then head back home to sit hunched over their computers for another four hours before repeating it all again the next day. Even most gym-goers perform the same kind of movement over and over again, using hard-surfaced, standardized equipment, and as a result find themselves suffering from pain and injuries. The foundation for the training at Cheveyo consists of highly functional movements performed on a natural training ground. This way, Cheveyo Training Camp can ensure a much higher variation in range of movement and subsequently, how the body’s muscles are stimulated. 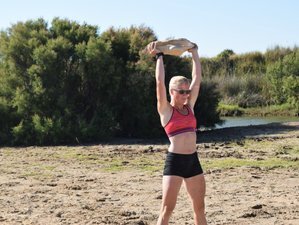 During this training, you will practice bodyweight strength and conditioning, training with natural objects, boxing, kettlebells, running and sprinting in trail and off-track, barefoot, and the sand, parkour, muscle release techniques, yoga and mobility work, and various team challenges, games, and competitions. You can enjoy additional activities, such as surfing, horseback riding, and might even throw in a professional massage here or there. The training brings together all the essential elements such as a scenic outdoor training facility, personalized workout routines, customized meal plan, and inclusive resort amenities, so that you can leave the camp feeling a distinct improvement in your overall health, well-being, and fitness. Cheveyo is a serious and ambitious training camp which aims to boost your health, physical condition, and performance levels. Your hosts will focus on bringing a highly functional training to you in a natural environment so that you can optimize the variation in movement patterns and training stimulus. There is no requirement of fitness level to attend. This training camp will take place at Zahora, Spain. The camp is located right in the middle of Zahora, about a 15-minute walk (or a five-minute run) from the beautiful Zahora Beach. The participants consistently remark how much they appreciate the pristine sand and beautiful sunsets that are visible along the Costa de la Luz or Coast of Light. This coastal area is one of the least spoiled in Spain, and since it is one of the few holdouts still not affected by mass tourism, the beaches here are said to be among the most beautiful in the country. The La Breña National Park is located right in the camp's backyard. The park has one of the most spectacular stretches of rocky cliffs along the Andalucian Atlantic coastline, with stunning views over the sea and to the rocky headland of Cape Trafalgar and its lighthouse. During this training, you will enjoy three daily healthy meals. The diet supplied throughout the course is based around the principle of natural foods and the use of organic and locally grown produce. Only the most nutritious, non-processed ingredients are used in the meals because a healthy body starts with a healthy diet. The Cheveyo diet has been specifically formulated to secure a well-balanced amount of nutrients, including an optimized fatty acid ratio, and is both gluten free and dairy free. The main components of the diet include fruits and vegetables, a free range of meat and eggs, seafood, seeds and nuts, pure oils, and heart-healthy spices. Similar to the well-known Paleo diet, Cheveyo’s diet is based on the idea of getting back to basics. Namely, this means ingesting food that the body originally adapted to live on like fresh products found naturally in the wild. Many who come to the camp will experience a diet with a lower ratio of carbohydrates than they’re used to. It may take a little while for your body to adapt its metabolic systems to this change, a process which will typically be felt in the form of cravings for sugary foods. However, if you can get past your initial cravings to bury your face in a chocolate cake, the benefits of this diet change are numerous. Many clients experience improved insulin sensitivity, better body composition in terms of their ratio of muscle to body fat, improved hormonal balance, and a strengthened immune system. Seafood is a large part of the Cheveyo diet, so if you do not like seafood or are allergic to certain types of seafood, please let your hosts know and they will arrange an alternative protein source for you. During your free time, you can enjoy additional activities, such as surfing, horseback riding, and might even throw in a professional massage here or there. If you are looking for another cheap way to travel and find that you have a little flexibility regarding travel times, the car sharing modality is an option. Car sharing is very popular in Spain, and it should be easy to find a lift to either from Conil, Vejer, or Barbate, at which Cheveyo Training Camp can pick you up. Please book your flight to arrive at Jerez Airport (XRY). Transfer from and to this airport is available upon request for approximately 40 EUR per person. Alternatively, you can arrive to Gibraltar International Airport (GIB) or Seville Airport (SVQ). Transfer from and to this airport is available upon request for approximately 40 EUR per person. If you decide to arrive at Malaga Airport (AGP). Transfer from and to this airport is available upon request for approximately 60 EUR per person. Pickups are normally available on Saturdays and the days before the starting dates. The schedule of transfer is from 2:00 p.m. and 10:00 p.m.and should be ordered in advance. There is a bus that runs from the Malaga Airport (AGP) to a town called Algeciras. From Algeciras you can take a bus to either Vejer or Conil, at which your hosts can pick you up. You can also arrive at Barbate. Transfers to the training locations are free. Feel free to contact Cheveyo Training Camp for a more specific bus plan. Airport: Jerez Airport Airport transfer available: Jerez Airport (US$45 per person) Additional charges may apply. You can request this in the next step. Airport: Málaga Airport Airport transfer available: Málaga Airport (US$68 per person) Additional charges may apply. You can request this in the next step. Airport: Seville Airport Airport transfer available: Seville Airport (US$45 per person) Additional charges may apply. You can request this in the next step. Airport: Gibraltar International Airport Airport transfer available: Gibraltar International Airport (US$45 per person) Additional charges may apply. You can request this in the next step. The deposit is fully refundable if the booking is cancelled up to 20 days before the arrival date. The Cheveyo Training Camp aims to boost your health, physical condition, and performance. They focus in a highly functional training.